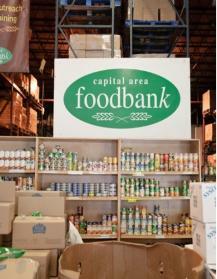 For the past 30 years, the Capital Area Food Bank, or CAFB, has been the largest food collection, storage and distribution facility in the Washington metro region. Each year, the CAFB distributes over 20 million pounds of food and 6 million pounds of fresh produce through its network of more than 700 member agencies. CAFB, operating out of an antiquated facility too small to support its ever expanding client base, sought NMTC financing to purchase and renovate a new facility. Using funds raised through an extensive capital campaign, charitable contributions, grants from the DC Department of Housing and Community development, and equity provided by our partner, JP MorganChase, City First made a $20 million loan for a new warehouse and distribution center. Completed in late 2011, the new facility on Puerto Rico Avenue, NE contains 100,000 square feet of warehouse and 25,000 square feet of office space, as well as 162,000 cubic feet of freezer and 253,000 cubic feet of refrigerator space. Within five years, the new CAFB warehouse and distribution center will double its capacity to 40 million pounds of food. In addition, CAFB will enjoy lower occupancy and operating costs, benefit from greater efficiencies among staff, Board and volunteers, technological upgrades and significant expansion of its services, such as the Kids Café program which will expand to 100 locations in DC public schools. This project, like Mary’s Center expands services and benefits in low-income communities, and also promotes job development. The CAFB project created 20 new permanent jobs, retained 73 existing jobs and created 172 construction jobs.